Commercial fisheries occur for both black oreo (BOE) and smooth oreo (SSO). Oreos are managed as a species group (OEO), which also includes spiky oreo (SOR). 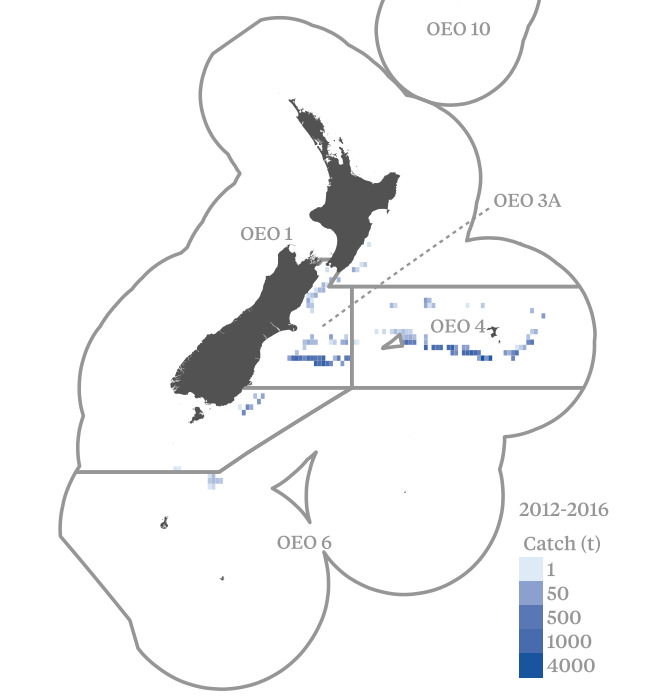 The main fishing area for oreo is on the Chatham Rise (OEO 3A and OEO 4), but other fisheries occur off Southland on the east coast of the South Island (OEO 1/OEO 3A), and on the Pukaki Rise, Macquarie Ridge, and Bounty Plateau (OEO 6). In the past oreo catch has been taken as bycatch of the more valuable orange roughy fisheries but target fisheries are now much more common in most areas for smooth or black oreo. Black and smooth oreo have been found within a 600 m to 1500 m depth range. Unvalidated age estimates indicate that black oreo is slow growing and the longest lived with a maximum estimated age of 153 years. Oreo is managed by the Ministry for Primary Industries using the Quota Management System (QMS). The Ministry works in partnership with Deepwater Group (a not for profit organisation that works on behalf of fisheries quota owners). Work is currently underway as part of the Deepwater Group’s Fishery Improvement Plan (FIP) for the oreo fisheries. The risk assessment covers over 85% of oreos caught in New Zealand. The status of the oreo stocks varies by region and species. The SSO 3A stock appears to be highly likely to be above the point of recruitment impairment (PRI) and there is evidence that the stock is likely to be fluctuating at or around the target reference level. It appears highly likely the SSO 4 stock is also above PRI, but likely to be below the target reference point. The position of the BOE 3A stock relative to target and limit reference points is unknown but catches have fluctuated around the long-term average from 2002-03 to 2001-12. There is work underway to improve age validation and stock assessment for both main oreo species in OEO 3A as part of the Deepwater Group led Fishery Improvement Plans. Although information is incomplete, sufficient information appears to be available on stock structure, productivity and fleet composition in the smooth oreo fishery to support an effective harvest strategy. The main weakness appears to be uncertainties in some of the population parameters (e.g., age, growth) in the different areas of black oreo stock. The absence of a reliable assessment limits capacity to evaluate the position of the stock against reference points and apply harvest control rules. Accordingly, some, but not sufficient, information appears to be available to support the harvest strategy. For the recent oreo fishery (since 2002), oreos (mainly black and smooth oreos) accounted for about 92% of the observed catch and about 96% of the total reported catch from the target fishery. The remainder of the (observed) catch was mainly orange roughy (3.5%), hoki (0.6%), and ling (0.3%), plus nominal amounts of non-commercial species. Orange roughy, hoki and ling are all MSC certified fisheries. The main potential endangered, threatened and protected species interactions in the oreo fishery are with seabirds, marine mammals and protected corals. The available evidence indicates it is highly unlikely the trawls involving oreo will hinder recovery of seabird species. In the most recent assessment, only one species of seabird, black petrel, had a median risk ratio higher than 1 (or upper 95% confidence limit higher than 2). There have been no estimated captures of black petrel in the oreo trawl fishery between 2002-03 and 2014-15. There have been no observed incidental captures of New Zealand sea lions by trawlers targeting oreos from 2002–03 to date, but occasional captures of New Zealand fur seals are observed (which were classified as “Not Threatened” under the New Zealand Threat Classification System in 2010). Between 2002–03 and 2014–15, there were eight observed captures of New Zealand fur seal in oreo trawl fisheries, with estimated captures 2 or less since 2008-09. Based on this evidence it is highly unlikely that the fishery is impacting on marine mammals. There are no national or international limits set for protected coral interactions, however given the very small proportion of the predicted distribution of each main protected coral group covered by the oreo fishery trawl footprint (<0.6% across the EEZ and <1.9% across the main trawl ground), it is probably reasonable to assume that the oreo fishery is highly likely to not hinder recovery of coral species. Fisheries 2030, the National Fisheries Plan, and the Annual Operational plan provide well defined and explicit long and short-term objectives for the oreo fishery. There is no accepted stock assessment model for BOE 3A, albeit standardised catch per unit effort has remained relatively stable at or around the long-term average since 2002-03 (to 2011-12). The 2014 assessment of SSO 4 suggested a decline in biomass and a high likelihood (>90%) that overfishing was occurring. The Total Allowable Commercial Catch has since been reduced from 2015-16 to levels which should allow the stock to rebuild to target levels within 30 years. The Deepwater Group is leading Fishery Improvement Plans for all three stocks. Target species (SSO 3A) - Improving: Stock projections with the current catch limit of 1400 t show increasing biomass. The Deepwater Group Fisheries Improvement Plan aims to strengthen age validation and the stock assessment, as well as undertake management strategy evaluation. Target species (BOE 3A) - Uncertain: The Deepwater Group Fisheries Improvement Plan aims to strengthen age validation and the stock assessment, as well as undertake management strategy evaluation. Target species (SSO 4) - Uncertain: Total Allowable Catch (TAC) was reduced to 3,150 t in 2015-16 which is expected to reverse the decline in biomass and move the stock towards Maximum Sustainable Yield. A non-regulatory limit of 2,000 t is applied to smooth oreo. The Deepwater Group Fisheries Improvement Plan aims to strengthen age validation and the stock assessment, as well as undertake management strategy evaluation. Bycatch and ecosystems - Stable: No major changes to existing bycatch and ecosystem arrangements are expected.